Promoting the benefits of eating coconut, Coco Easy was created to communicate the taste experience and the premium quality of this fresh fruit product. The concept of the packaging focuses on conveying the notion of freshness in a simple and easy way. A coconut is a natural product, with each coconut having a distinctive shape and size as well as continuing to breathe and ripen even after harvest. Consequently, there were high demands on the pack-aging material, as it had to present the product in an attractive way and, at the same time, provide adequate functionality. 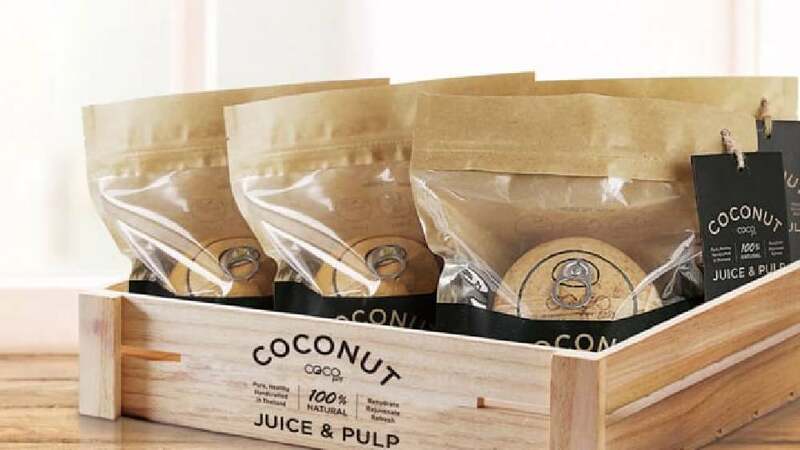 The highly breathable and waterproof plastic seal bag not only protects the coconut, but also allows consumers to check the freshness of the fruit through the transparent window. Furthermore, the kraft paper on the outside creates the texture and key message “Simple, Natural, Fresh” in order to highlight the philosophy behind the product directly on the packaging. Natural colours and an unobtrusive typeface further underline the notion of high quality and freshness. This design concept solves the task of developing a packaging for fresh coconuts through a consequent extension of the fruit. A clever opening, for inserting a straw, was added to the shell itself, while a breathable and waterproof plastic seal bag protects the coconut and gives consumers a view and proof of the fruit’s quality. This communicates the brand message of offering a real natural product both properly and pleasantly.